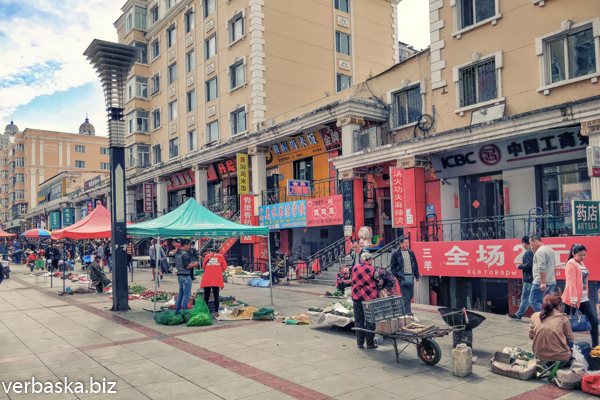 Chinese traders lay their goods on the ground in the middle of the street. The market street in the center of downtown. The street lined with light granite tiles. There is a black and white street lamp pole. Peasants lay their goods on the ground in the middle of the pedestrian street. Some of the traders sit under sun tents. The small shops are at the side of the street on the ground floor of the residential buildings. The signboards mainly red and yellow traditionally bringing luck and wealth. People walk along the street. Taken in Suifenhe town, Heilongjiang province, China.